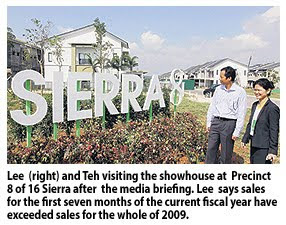 Property developer IOI Properties Bhd expects sales to grow by 30 per cent for its current fiscal year ending June 30 2010, driven by the launch of two phases of its "16 Sierra" residential development. "We expect to achieve sales of about RM850 million this year. However, that is only a conservative target," said its general manager of marketing and business development, Lee Yoke Har. She said sales for the first seven months of the current fiscal year have already exceeded the company's previous year's sales of around RM650 million. IOI Properties general manager Teh Chin Guan is optimistic of the general property outlook this year in line with the worldwide economic recovery. The company has a slew of ongoing developments, namely in Bandar Puchong Jaya and Bandar Puteri Puchong, Selangor. Both these township developments sprawl over 404ha, with Bandar Puchong Jaya already 80 per cent developed and Bandar Puteri Puchong on its last leg to completion. Teh said IOI Properties has no plans to halt new launches. On the drawing board are property developments next to IOI Resort, Putrajaya and plot of land within the Jalan Ampang embassy enclave in Kuala Lumpur. The Putrajaya project is a mixed commercial development that includes office towers, shop houses and a shopping mall. "We are doing some groundwork at the site now. We are relocating the existing golf course to make way for the development plan," Teh said. The development which may be launched in 2 to 3 years spreads across 162ha and is expected to keep the company busy for about 15 years. At the Jalan Ampang site, IOI Properties plan to build a "super condo" on a small plot of land. "We are actually submitting the plans for the high-rise residential development. The launch time depends on the market conditions. There is no hurry to launch. I think we want to construct it first," added Lee. Meanwhile, the 216ha 16 Sierra project with a gross development value (GDV) of RM2 billion is planned as a green township, offering 16 garden themes. IOI Properties will launch Precinct 8, the first phase of 16 Sierra, today , which features 147 residential units starting from RM448,900 each. It will also open bookings for the 104 units in the second phase of Precinct 8. The total GDV of Precinct 8 is RM130 million. PROPERTY developer Magna Prima Bhd will launch five projects, worth a combined RM1.2 billion, in the Klang Valley in the second half of the year. Its chief executive officer Yoong Nim Chee expressed optimism of a pick-up in the property market and said the projects would be launched starting June or July. They include the much-anticipated Magna Prima City, a RM400 million integrated development in Jalan Kuching, Kuala Lumpur, which will feature serviced apartments, retail mall and shop-offices. "I believe the market is going to be stable. There is underlying strength in the market. We have people with money to spend. For us, it is going to be a very eventful year," Yoong told Business Times after the company's extraordinary general meeting in Batu Caves, Selangor, yesterday. Magna Prima has formulated a five-year business plan, which will be assessed yearly. "One of the strategies is to focus on high-value, low-residue developments and buy pockets of land, instead of huge landbank, so that holding cost is reduced. We want to sell everything we build for quick turnover," Yoong said. Another project, costing RM100 million, will be developed in Section 16 in Shah Alam, Selangor. It will comprise a gated and guarded residential community of 300 terraced houses on about 7ha. "This is a low-density development which we will launch in phases. We are going for terraced houses to maximise the land value," Yoong said. Magna Prima is planning a similar residential project in Selayang, Selangor, which is expected to generate some RM250 million gross development value. It is buying 11ha for RM57 million for the project. It also plans to launch a gated development in Bukit Jalil, Kuala Lumpur, of terraced and semi-detached houses, worth RM80 million. However, the project is pending completion of a sale and purchase agreement with Ho Hup Construction Sdn Bhd. In Section 5 in Petaling Jaya, Selangor, Magna Prima will launch a lifestyle commercial project, valued at around RM300 million. There will be four- to five-storey shoplots, a boulevard and a neighbourhood mall. The development, which may begin late this year or early next year, will take up about 3ha freehold land along Jalan Gasing, which the company bought for RM48.5 million. "With all the projects lined up and the completion of existing ones, we hope to surpass our 2008 net profit and revenue this year," Yoong said. In the nine months to September 30 2009, Magna Prima posted a net profit of RM6.4 million on revenue of RM179.3 million. In 2008, it made RM26.9 million net profit on RM280.6 million revenue. Land JV in China (RM500mil GDV) is expected to take off after all the necessary approvals are obtained in the next 12-18 months, JP Morgan says. SP Setia Bhd’s performance in southern Johor will be on the road to stronger growth given the number of projects in the pipeline and the overall economic recovery in the country, says executive vice-president (property division – northern and southern region) Chang Khim Wah. “We will launch several hundred houses this year in all our four projects and we expect sales to be healthy,” says Chang. 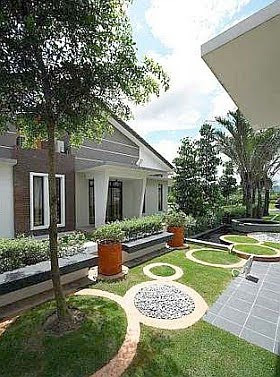 Setia EcoGardens show house and (inset) Chang Khim Wah. On average, about 800 to 1,000 units will be launched in each of the four developments with price ranging from RM300,000. The company will also launch some high-end semi-detached and bungalow units ranging from RM1mil in all four projects. “This is a very conservative figure,” says Chang, adding that more may be introduced into the market based on prevailing market sentiments. He says the company’s winning factor is the diversity of products and their location. Due to the different locality, each of the four projects will have their own draw. Bukit Indah, established some 10 years ago, with its proximity to the Second Link has become very popular whereas Setia Tropika, which is adjacent to the North-South Expressway, offers urbanised contemporary living. Setia EcoGardens is the latest and most green project. When completed, Setia EcoGardens will have a total gross development value (GDV) of RM3.5bil, comprising 6,600 residential and commercial properties; about 900 units have been launched cumulatively. Setia Indah is also very established with basic amenities. Although Johor has been known to have the highest incidence of property oversupply, Chang says the company’s development has never experienced this problem. “Purchasers want new concepts and we have strived to provide elements of differentiation. This has been our competitive advantage,” he says. Chang adds that overall, the company’s selling points are location, lifestyle, overall concept securty and brand and reliability. “About 80% of our purchasers come to us through word of mouth,” he says. As with last year, Chang’s strategy this year will be to limit the number of units per launch to about 50 units or less, depending on area and type of housing. The company launched 75 units of double-storey housing in Setia Indah in November which is currently 80% sold. A week ago, it launched 45 more units costing about RM400,000 each in the same area which, to date, is half sold. The company will be launching a further 66 units this March in Setia Indah and 22 units of bungalows in Setia Indah after June. There are plans to launch 300 units in Setia Tropika this year. Because all four projects are located in Iskandar Malaysia, the company will be able to tap into the growth of the country’s foremost economic growth region. “Major roads are being widened to four lanes and rivers are being cleaned. We have seen an improvement in infrastructure over the last two years and this will add value to all our projects. A lot of money has been poured to improve the standard of living in southern Johor. We also see more police patrols to curb crime. Definitely business will improve and this will lead to job creation. In that respect, sales have been good,” says Chang. With the company’s “The best of the best” promotions coming to an end by April this year, the company will “no longer have a margin loss,” says JP Morgan. The group’s project at the new KL EcoCity and international expansion will also be another growth catalyst. “Privatisation of land for the RM6bil EcoCity commercial project is expected to be completed by August this year, with the launch targeted for October. “The commercial component will account for 70% with residential making up the remaining 30%. Focus for the commercial component will be mainly on service apartments and offices,” JP Morgan says. SP Setia’s share of profits in this JV will be 48% (after netting off 20% of profits to be paid as consideration for the land over the project period of between eight and 10 years). The group is expected to spend upfront capital of about RM250mil to improve infrastructure and accessibility to the project. Joint ventures the new way to build? The coming together of two well regarded property groups, Sime Darby Property Bhd and Sunrise Bhd, to jointly develop a RM1bil integrated commercial property project in Bukit Jelutong, Selangor is quite a new development in corporate Malaysia and will be closely watched by industry players to see how it pans out. The 50:50 joint venture agreement that was inked on Tuesday is bound to create some ripples in the market for various reasons. Firstly, these are two highly successful developers with strong track record and branding in their respective niche sectors in the local property market. Sime Darby Property is well regarded as an established township developer with award-winning townships including Subang Jaya, UEP Subang Jaya or USJ and Ara Damansara. Sunrise, which specialises in luxurious condominiums and lifestyle commercial projects, is behind the huge success of Mont’Kiara as a vibrant neighourhood and a favourite property hotspot. Over the years, it has garnered a strong following of repeat buyers and investors who are loyal to the Sunrise brand. Both Sime Darby and Sunrise have also gone international with projects in various parts of the globe. As in all partnerships, the question of who will lead as the manager will also crop up. At an analysts briefing on Thursday, Sunrise executive chairman Datuk Tong Kooi Ong discloses that the manager will be from Sunrise and both partners will have two representatives each on the board of Sime Darby Sunrise Development Sdn Bhd. Sunrise’s value proposition of replicating its trademark Solaris commercial project in the heart of Bukit Jelutong Commercial Centre will inject more life and further accelerate the development of the fast maturing Bukit Jelutong township. Moving into a new growth area like Bukit Jelutong, which is the gateway to the massive Guthrie Corridor, certainly fits into the bigger plans of Tong who is eager to expand Sunrise’s reach and presence outside of Mont’Kiara. With the fast changing market environment which will only get tougher as time evolves, forming strategic alliances will be the way forward for property groups to leverage on each other’s strengths and further sharpen their competitive advantage. While some of the developers would already have lined up sufficient land to last them for the next couple of years and some up to the next decade or more, many of the companies are operating from “hand to mouth” or just have enough land for their ongoing projects. Their main handicap is to get hold of the right piece of land to undertake new projects and ensure their capacities are put to good use for regular income streams. With its vast land bank, Sime Darby Property certainly looks like a good partner to team up with. Having plantation group Sime Darby Bhd as its parent is definitely a boon for Sime Darby Property as far as landbanking is concerned. The mega Sime Darby merger in 2007 that involved Sime Darby Bhd, Kumpulan Guthrie Bhd and Golden Hope Plantations Bhd has created the country’s largest property group in terms of land assets and sales. The merger resulted in the enlarged Sime Darby group owning a sprawling plantation land of close to 500,000 acres, of which 37,000 acres are under Sime Darby Property, the group’s property arm. Certainly there is much value to be realised from the vast landbank and what better way to unlock their value than to invite the specialists of the various property sectors to partake in the development plans. This way, the high value adding initiatives by the joint venture partners will ensure higher value can be realised from the land in a shorter time. Property development is certainly a challenging business that needs constant new refreshing and creative ideas to remain at the top. One way of ensuring a developer’s name is held in high regard is to have well-planned and designed projects in the right locations. In view of the tough environment that companies are still operating in, there is a need for them to adopt more market savvy and value-enhancing strategies to stay ahead of the game. Even big corporations with strong reputation and deep pockets cannot take their existence for granted and have to be consistently vigilant of how they are faring. Forming strategic alliances and partnerships between companies, whether they are big or small players, will open up more opportunities and provide a cushion to meet the challenges ahead. Deputy news editor Angie Ng believes every property project, however small or big, deserves to be treated with reverence and be given the best thoughts and efforts. KUALA LUMPUR: IOI Corp Bhd’s property arm IOI Properties Bhd is confident of selling all 147 residential units offered under phase one of its Adenia project by tomorrow. IOI Corp (property division) general manager Teh Chin Guan said the two-phase Adenia was a component of its mega property project 16 Sierra in Puchong. To be completed by 2020, the project has a gross development value of RM2bil. Worth RM70mil, phase 1 of Adenia had already recorded 50% booked sales, he said. Based on this encouraging response, the company expected the remaining available units to be taken up soon, Teh said after the soft launch of Adenia yesterday. The official launch of Adenia is today. The average price per unit is about RM448,900. The two-storey terrace homes have a lot size of 22ft by 75ft and are targeted for handover by the middle of 2011. “Phase 2 will comprise 60 units worth RM50mil in total and should be launched in a couple of months,” Teh said, adding that prices for Phase 2 units would be slightly higher than in Phase 1. Teh said there would be 14 other small residential property projects to be developed in 16 Sierra, which sits on 535 acres in the southern part of Puchong and near Cyberjaya and Putrajaya. IOI Corp general manager (marketing and business development) Lee Yoke Har said 16 Sierra would have a central park and 16 interconnected themed gardens. When fully developed, 16 Sierra would have 3,838 residential units and each property project would be gated, Lee said. On IOI Properties’ performance, Lee said it had not been significantly affected by the economic downturn last year. “We maintained our sales growth last year despite the tough times and with the expected recovery of the property market this year, the company expects to perform even better,” she noted. PETALING JAYA: Property developer MK Land Bhd reported a lower net profit of RM3.8mil in the second quarter ended Dec 31 from RM5.2mil a year earlier, but sees a better year ahead on expectation of higher sales and tighter cost control. Revenue was flat at RM48mil. It was also confirmed that three of four chief operating officers of MK Land had left recently. A top company executive was quoted by StarBiz on Wednesday as saying that internal management changes were an ongoing process to strengthen the group. “With the continued confidence and mandate accorded to me by the board of directors and the support of the existing management team, we have managed to establish good relationship among our stakeholders, all of which have translated into the performance of the company,’’ Mustapha said in yesterday’s statement. MK Land is also in the midst of raising fresh funds with the proposed rights issue to raise at least RM150mil. Mustapha said the group was cautiously optimistic about its prospects moving forward given the increased interest of buyers of MK Land’s property projects in the Klang Valley. PROPERTY developer MK Land Holdings Bhd's second quarter net profit dropped by almost a third because of lower operating income and higher marketing and selling expenses. It registered a net profit of RM3.8 million in the quarter ended December 31 2009 compared with RM5.2 million in the previous corresponding period. This was despite an increase in revenue to RM48.4 million from RM47.8 million previously. The group is cautiously optimistic on its future prospects given increased interest from purchasers in its property projects in the Klang Valley. "In addition, the improvement in the global economy together with the stimulus packages rolled out by the government will augur well for the economy and the group," it said in a statement yesterday. Second quarter net profit more than doubled, however, when compared with the RM1.2 million made in the first quarter.